Every year landmines and other explosive hazards kill or injure thousands of people across the globe. The toll of human suffering is devastating. More than one million children, women and men have been killed or maimed for life by exploding landmines since 1975; 80% are civilians. Twenty-six thousand people are maimed each year. Afghanistan has 10 million anti-personnel mines; Angola 9 million; Cambodia 4 million; Mozambique, Somalia and the Sudan each 2 million; Ethiopia and Eritrea 1 million, says UNESCO. Today, landmines are still in more than 60 countries, is the greatest risk to communities and security personnel across the globe. In fact, the cost of removing landmines from the world is up to 50 times more than its production, estimates the UN. The removal of landmines has made great progress in the last two decades, however, in recent years ongoing internal conflicts in many areas have increase the use of landmines, damaging and isolating civilizations. The Mine Kafon Drone (MKD) could solve the current chronic issue of landmines in the world. The creator of drone; Massoud Hassani says the MKD technology could potentially clear the world of land mines in less than 10 years! Really, it has the greatest humanitarian mission of clearing land mines easier, cheaper and safer throughout the world. Massoud Hassani was born in Afghanistan and moved to Holland for challenging opportunity. In past, inspired by the homemade wind-powered toys he made during his childhood in Afghanistan, Massoud created the Mine Kafon wind-powered landmine detector for his 2011 graduation project. How does MKD drone work? 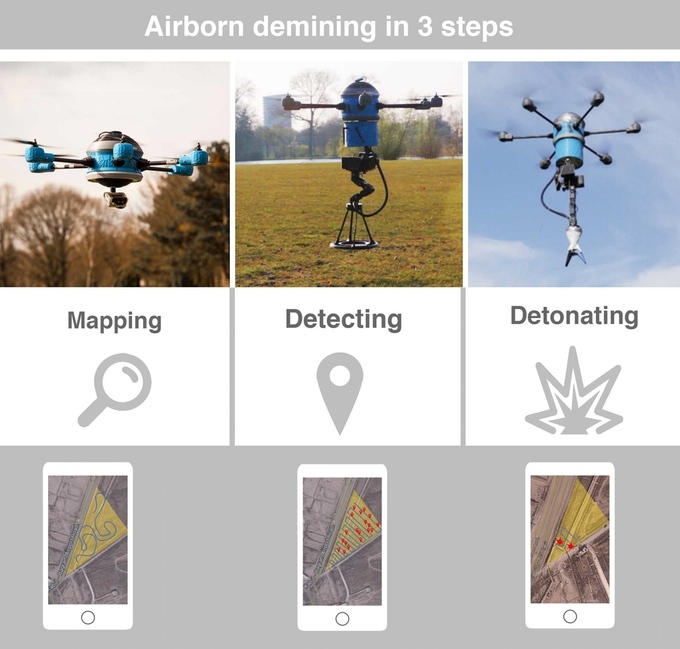 The MKD drone adopts three basic methodologies – Mapping, Detection and Destroying the land mines using its three different attachments and six rotors. Initially, drone flies over the whole field with an aerial 3D mapping system to identify the dangerous areas using GPS. It hovers above the ground at approximately 4 cm to detect mines. Detected mine is geo-tagged on the operator’s system to construct a map of known mine locations. Using robotic gripping arms, it places a small detonator on every detected mine and finally detonated from a safe distance using a timer. It is about 200 times cheaper and up to 20 times faster than traditional demining technologies, much safer to operate, as there is no human directly involved in operation. “Mine Kafon is not only an anti-landmine device; it opens a discussion of global awareness” – Massoud Hassani. ED Public Awards 2011, Connecting Ring 2011, Social Design Awards 2010 and nominated for -The Designs of the Year 2012 by the Design Museum in London, Icon Design Of The Year 2012 and Breakthrough Talent of The Year 2012. The Kickstarter crowd funding campaign of MKD drone is currently live for a goal of €70,000 and still 42 days to go. We should support this campaign as it has a human touch and we must get rid of all land mines from the world. “The World without Land Mines”.